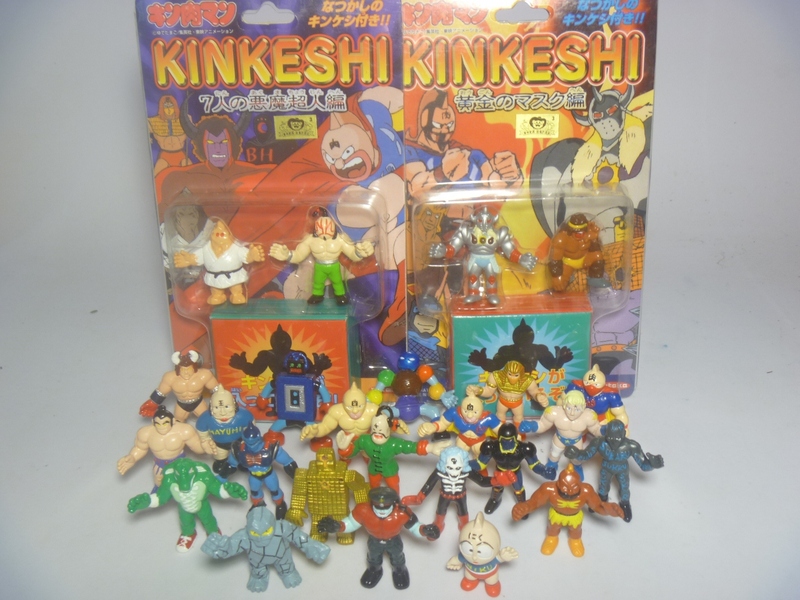 This week the Painted Kinkeshi series are showcased. These figures are not custom painted figures. These are factory painted and sold in 2-packs as shown. There are 30 in the set (of which I have 25). You can tell they are factory painted as the paint job is smooth and quite well done. The majority of the 30 figures are M.U.S.C.L.E. sculpts. 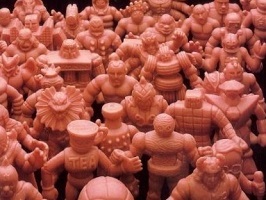 While the sculpts may be M.U.S.C.L.E.-like, the texture of the figures is much closer to Kinkeshi rubber. A lot of my favorites are there – M.U.S.C.L.E. 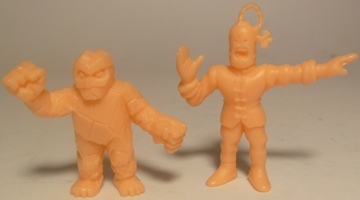 figures #23, 25, 36, 60, 72, 82, 156 and a couple of key Non-M.U.S.C.L.E. sculpts like Shouting Geronimo and Brockenman. They are all painted in the colors of their cartoon characters as well. I REALLY like these figures; they are an affordable alternative to getting a custom paint job done. Around $10 for a pack is a great price. The real bonus with these figures is in the piece of the packaging shown only by a shadow. 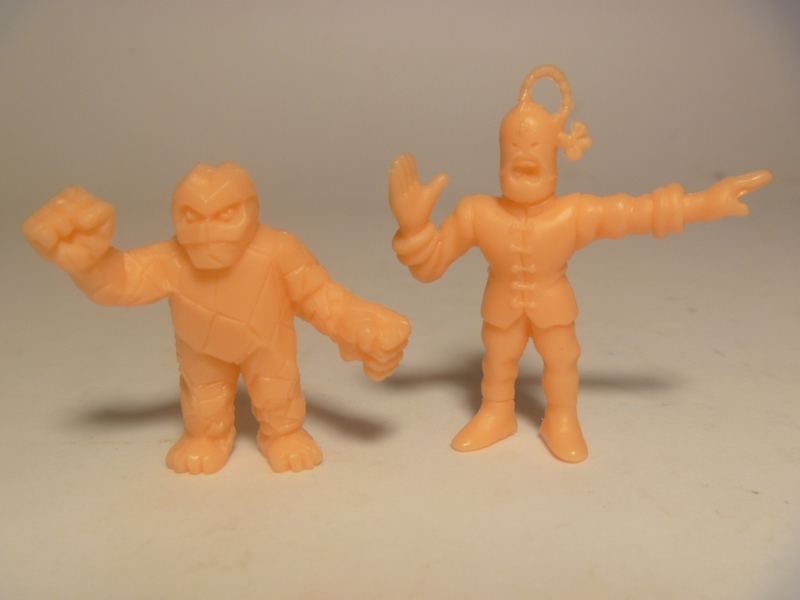 There you will find a third figure in M.U.S.C.L.E.-like hardness in a faded Flesh-like color. 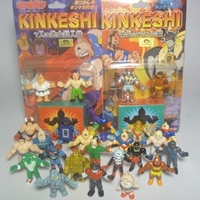 The reason this excites me is that this third figure is completely different from any other Kinkeshi offering in color and texture – very close to M.U.S.C.L.E. The third figure is always one of the 30 in the set. What confuses me is why didn’t they use these figures for painting? This entry was posted on Monday, April 28th, 2014 and is filed under UofM News. You can follow any responses to this entry through RSS 2.0. You can skip to the end and leave a response. Pinging is currently not allowed. Were can I get these? They look great.